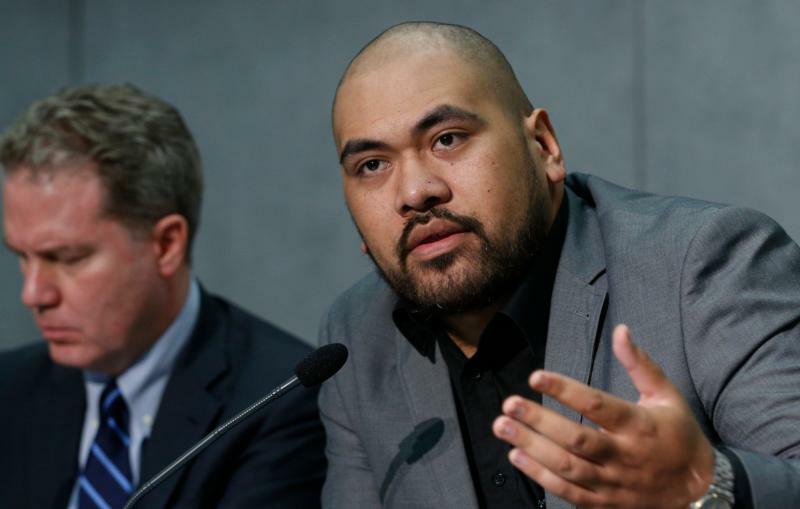 Samoan observer Joseph Sapati Moeono-Kolio speaks at a briefing to discuss the Synod of Bishops on young people, the faith and vocational discernment (CNS photo/Paul Haring). VATICAN CITY (CNS) -- The synod's final document will seek to address issues concerning all young people and not just those issues facing young men and women living in Western countries, said members participating in the Synod of Bishops. The various speeches and small-group discussions within the synod process have "enabled us to see the entirety of the many issues that young people face around the world," Samoan observer Joseph Sapati Moeono-Kolio said Oct. 23 at a Vatican briefing for journalists. Throughout the discussions leading up to the synod's final week, Sapati said, small groups "have been very specific and intentional that we don't become too Western with our approach." "Whether or not there will be a Western focus on the document, we don't know, we haven't read it, it's not fully finished yet. But I can say for certain that in the process leading up to that, everyone that has been part of the synod has been very intentional in making sure that that it is not Eurocentric," he said. "Everyone that has been part of the synod has been very intentional in making sure that that it is not Eurocentric," Joseph Sapati Moeono-Kolio said. Cardinal Luis Antonio Tagle of Manila told journalists that, as someone involved in the preparations leading up to the synod, "there was this sort of attention to the diversity and complexity of contexts so that" the process would not be "accused again" of being Eurocentric. However, he noted, even the small language groups are challenged in understanding and expressing the issues discussed because "every language carries a whole world and culture." "I belong to the English-speaking group. But we came from different continents and, wow, I realized we were using eight or nine different types of English," Cardinal Tagle said. "And so, having the label 'English Group D' doesn't mean we understand the same things when we use the same word. So, there will always be this challenge of finding some sort of common ground in the midst of diversity." Congolese Bishop Bienvenu Manamika Bafouakouahou of Dolisie also confirmed that during the synod discussions, there was "a universality of themes" that centered on how they affect all young people and not just those in Europe or farther West. Discussions, such as those concerning Catholics who identify as LGBTQ, are not a major issue in Africa compared to Europe, Bishop Manamika said. However, the Congolese bishop said the issue of how best to minister to people in the LGBTQ community "will be more widespread" in Africa as time goes on and, therefore, will be an important theme to discuss. Jesuit Father Antonio Spadaro, editor of La Civilta Cattolica, told journalists that the increasingly diverse representation throughout the history of the Synod of Bishops "makes the conversation between synod fathers richer and more complex" and allows the church to be able to listen to and "immerse itself in different cultures." "An event like the synod," Father Spadaro said, "becomes almost a miraculous event where people from every part of the world share the same faith but embody it in different cultural contexts where they can converge on some issues." With Francis not resolving the abuse crisis by defrocking McCarrick, Wuerl, et al., for starters, no one cares what happened at the "youth" synod.